Mount Saint Elias (18,008') is a massive peak with huge ridge lines, monster glaciers and steep terrain. There are no easy routes up -- or down the mountain. Mount Saint Elias, also designated Boundary Peak 186, is the second highest mountain in both Canada and the United States, being situated on the Yukon and Alaska border. It lies about 40 kilometres (25 mi) southwest of Mount Logan, the highest mountain in Canada. The Canadian side is part of Kluane National Park, while the U.S. side of the mountain is located within Wrangell-St. Elias National Park and Preserve. Its name in Tlingit is Yaas'éit'aa Shaa, meaning "mountain behind Icy Bay", and is occasionally called Shaa Tléin "Big Mountain" by the Yakutat Tlingit. It is one of the most important crests of the Kwaashk'khwáan clan since they used it as a guide during their journey down the Copper River. Mount Fairweather at the apex of the British Columbia and Alaska borders at the head of the Alaska Panhandle is known as Tsalxhaan, it is said this mountain and Yaas'éit'aa Shaa (Mt. St. Elias) were originally next to each other but had an argument and separated. Their children, the mountains in between the two peaks, are called Tsalxhaan Yatx'i ("Children of Tsalxaan"). 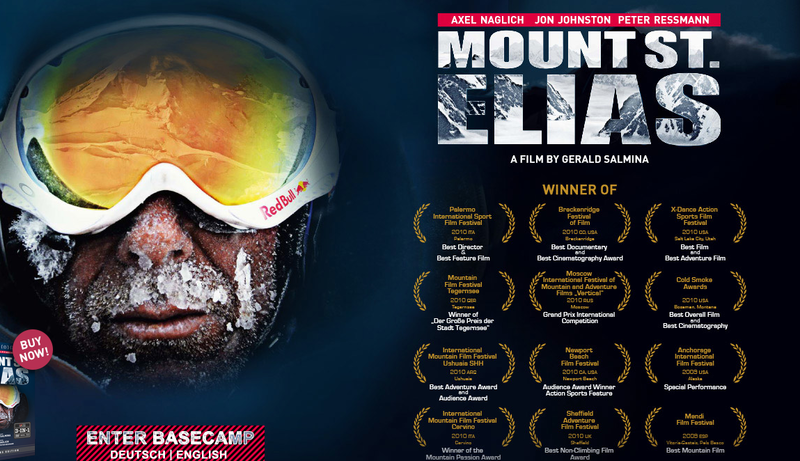 In 2007 a team of Austrian filmmakers went to the mountain to make a movie entitled Mount St. Elias, about the world's greatest ski descent. The goal was to ski from the summit all the way to the bay, which would make it an 18,000-foot ski line!!! dangerous. It's one thing to make steep jump turns with serious consequences for a few hundred feet, but to do it for thousands upon thousands of feet is a different story. In 2002, Aaron Martin and Reed Sanders attmepted to ski down the mountain. Both men were killed in falls during the attempt. This history provides a backdrop for the ski descent made by Axel Naglich and Peter Ressmann. The result is a gripping film about a serious undertaking by two world class skiers. Throughout the film Naglich becomes the primary narrator. His Austrian accent is reminicent of Werner Hertzog's narration in Grizzly Man or Encounters at the End of the World. I found Naglich's accent easy to understand and endearing. This is probably because of my fondness for Hertzog's movies. Naglich: F#@! this is steep! Caption: Golly this is steep! Naglich ws far from endearing to me. The team seemed fraught with discord, disagreement, poor communication, and disrespect. The film is awkwardly set to electric guitar soundtrack and over-dramatic symphony. It is narrated by hyperbole, fake radio transmissions, and confusing risk justification philosophy. Certainly, the scenery is spectacular and some if the footage is good. I personally didn't find the film very inspiring or moving and I grew tired of the machine-gun camera cuts and over-dubbed wind noise. That being said, if you're looking for another climbing and skiing film and have 100 minutes to spare, check it out. It's available on Netflix.